I'm a total beauty junkie. Especially during the summer. Currently, I'm addicted to anything by Rodin! After going through my entire bottle of Olio Lusso Face Oil, I'm now eager to try all their products. I took home a sample of their new perfume. Its scent it very similar to the face oil and is very soft and pretty. I also am eager to try more Matin + Gotez. While a candle isn't technically a beauty must-have, I recently came across it in blogger Erin's bathroom and became intoxicated by its earthy and smooth fragrance. It's a great addition to the 'getting ready' routine. i love rodin! and i think candles should definitely be included in any beauty must-haves! im obsessed with them! OMG...i can NOT wait to try that sugar lip scrub! and off to buy that polish ASAP! thanks for sharing! You know what's a perfectly good, and much cheaper alternative for that lip scrub? Brown sugar. Try it, it'll work perfectly. Thanks for sharing - always looking for new products to try out. Excited that you posted about a sugar lip polish, I LOVE their chapstick and use it all the time! So I am sure that I would love the polish! Never tried them but the RODIN packaging is really tempting! Tres chic! I know Rodin is expensive but I am on my second bottle of the face oil and it's blissful. I love putting it on and my skin is moisturized and dewy afterwards. I really want to try everything of hers, especially the perfume. Sigh. love the sugar lip polish! I've heard good things about the olio lusso hair oil, but I haven't tried it yet! Now I think I need to! 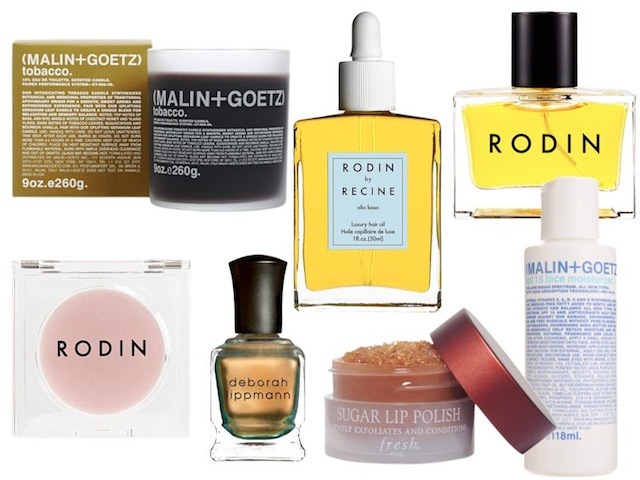 Curious about that Rodin oil!!! That Sugar Lip Polish looks amazing, I'm now dying to try it. Fantastic products. The sugar lips looks so soothing and nice. Love that sugar lip polish! That Deborah Lippmann polish looks just like Chanel Peridot! Very pretty! Gold nail polish is one of my addictions! Love the Rodin oil !! The rodin oil is very good. I can really recommend that. Love those products! Especially the yummy sugar lip polish! Thanks for the link love chica! These sounds really amazing!Love the items!Especially the sugar lip polish!